The first full box office week of 2015 saw two studio film releases that spanned the spectrum of rankings from top to bottom: Fox’s Night at the Museum: Secret of the Tomb snagged the top spot with $26.5 million, while Sony’s Annie came in last among new releases with a hair-curling $355,000, possibly the poorest opening ever for a major Hollywood studio film in China. Both Museum and Miss Granny, the Chinese remake of the Korean comedy hit of the same name (수상한 그녀) knocked Tsui Hark’s The Taking of Tiger Mountain out of the number one spot, which it had occupied for the previous two weeks. With its $132 million total as of this writing, Tiger Mountain is now the 6th highest grossing Chinese language film of all time, and the 3rd biggest 2014 release after Breakup Buddies and The Monkey King. 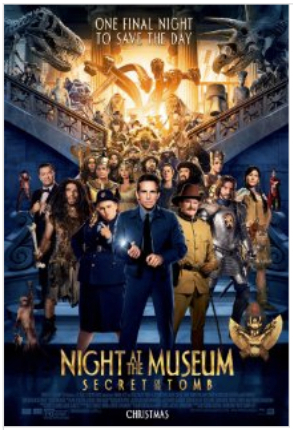 Night at the Museum’s take is especially impressive considering that this is the first installment of that franchise to enjoy a PRC theatrical release. Its opening week numbers indicate a projected final gross north of $60 million, which should put it around the average for studio releases this year. Annie, on the other hand, comes as a big surprise to the downside. Even taking into account its relatively modest release by China Film Group and Huaxia, with just 14,700 screenings during its first 3 days, the numbers are still mysteriously low, at just $23 per screening. By comparison, Khumba, a South African family animated film in its second week of release, earned more than double Annie’s average with $51 per screening. One wonders why Sony chose to use up a valuable release slot for the film, and even more, whether CFG and Huaxia put any effort into opening the picture. Overall box office was strong at $80.4 million up 45 percent over the same frame in 2014. 2015 is off to a strong start after the blackout neutered December, with the first two weeks of this year running 46 percent ahead of last year. Coming this week are the Jeff Bridges-Julianne Moore adventure vehicle The Seventh Son and the 3D reissue of Stephen Chow’s Kung Fu Hustle on January 16th, followed by The Hobbit: There and Back Again, which should clear at least $100 million if prior trends hold. Robert Cain is a producer and entertainment industry consultant who has been doing business in China since 1987. He can be reached at rob@pacificbridgepics.com and at http://www.pacificbridgepics.com. This entry was posted in Box Office Reports, Opinion and tagged Annie, Breakup Buddies, China Film Group, Hobbit: There and Back Again, Huaxia, 수상한 그녀, Jeff Bridges, Julianne Moore, Khumba, Kung Fu Hustle, Miss Granny, Monkey King, Night at the Museum: Secret of the Tomb, Rob Cain, Robert Cain, Stephen Chow, The Seventh Son, The Taking of Tiger Mountain by chinafilmbiz. Bookmark the permalink.